We only tend to get our passports out if we are travelling or if we need it for proof of ID. It is best to check at least a few months in advance as some countries need your passport to be valid for a particular period of time. Do you need a visa? have you printed off your boarding pass? It's best to be organised and keep everything in a folder together, along with important telephone numbers, making a note of your passport number in case you lose it etc. If you are travelling with children with different surnames to yours is a good idea to travel with their birth certificate or a letter from their Mum/Dad as proof that they are your child and you have permission to take them outside of the country. If you are planning on travelling outside the UK you may need to be vaccinated from life threatening diseases found in different parts of the world. You can find out what vaccination you might need by using the NHS fit for travel website. There is nothing worse than being at the check in trying to remove contents from your suitcase to make sure you are not over your weight allowance and having no choice but to pay extra. Invest in a suitcase scale, you can find them in most shops. I got mine from Poundland and have had good use out of it, saving me pounds! If you think you are going to need extra luggage pre book it in advance for a discounted price. Have you brought your travel and health insurance? If not, tut tut. You may think you don't need insurance but it is better to be safe than sorry. I wouldn't travel without one and they are not actually that expensive.If you are planning on travelling more than once over a 12 month period. You would be best off getting a one off year insurance plan rather than a single use as you can save money. Make sure you give yourself enough time to exchange your money, this way you can find the cheapest exchange rate and get it delivered to your home, if you don't want to travel with a lot of money on you. Get yourself a Prepaid card, which works as a pay as you go credit card. They can be purchaed from the Post Office or the bank. You load the amount you want on your card and can use it when you are out and about. It is also a great way to budget whilst you are away. 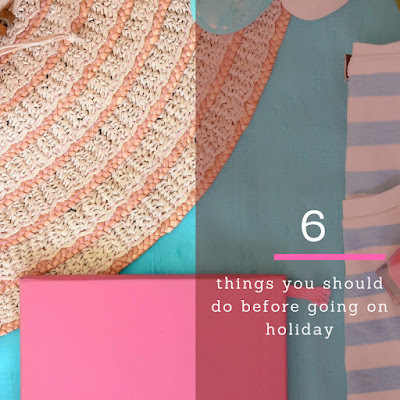 I hope you found my little check list helpful.Are you off on holiday this year? We have nearly been caught out with expired passports before! This is so helpful! Hope you enjoyed! Travel insurance has to be the most important thing (obviously after passports and visas). I would never travel without it. great tips, it's so much easier to not to miss anything if you have a checklist!